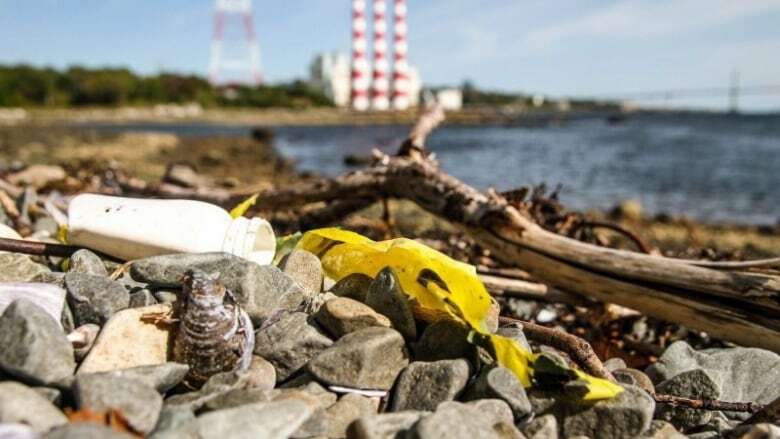 A Halifax-based environmental organization says corporations need to take responsibility for their contributions to waste polluting Canada's shorelines, green spaces and communities. The Ecology Action Centre partnered with Greenpeace Canada on Saturday to help clean up a beach and conduct brand audits in the Dartmouth neighbourhood of Tufts Cove. The audits, held by Greenpeace Canada in a number of World Cleanup Day events across the country, aim to identify the major corporate contributors to plastic trash. But on top of plastic trash, Ecology Action Centre policy director Mark Butler said the group has found a large amount of oil covering the beach's rocks and shoreline at low tide. Butler said he's been doing beach cleanups for 23 years and describes Tufts Cove as "one of the dirtiest urban beaches I've encountered in the [Halifax Regional Municipality]." Earlier in the summer, thousands of litres of oil leaked from a nearby Nova Scotia Power generating station, but utility spokesperson Tiffany Chase said the oil found on the beach is "not of recent origin" and the company doesn't know where it came from.